My friend Katie came up from Chicago yesterday with her three month-old son. He pretty much couldn’t be any cuter, really. He was so playful and smiley, and loved to be on the go. At which point he usually nodded off for a few, but he was a perfect trooper all day long. We were able to walk, talk, do lunch…and ice cream. For lunch I had every intention of getting a salad. I’ve really been enjoying salads lately, especially since the cook at work throws together these fresh fruit vinaigrettes that make your average work day lunch truly something extraordinary. But yesterday, I didn’t get a salad…because there was a portabello sandwich with goat cheese and pesto on the menu. You can’t combine 3 of my favorite foods, sandwich them between fresh ciabatta, and expect me to demonstrate willpower. I would like to make note that I not only shared my fries, but I left a good bunch of them on the plate. And then I had a really, really light dinner…before sampling the upside down blueberry something-or-other our neighbor brought by while Katie and I were out. Cookbook cooking and tasting…visitors…neighbors spoiling us with treats. There needs to be some greenery to balance everything out as of late, and lucky that hasn’t been a challenge at all. I’m discovering salad combinations that are truly note-worthy. Or should I say blog-worthy? The recipe swap theme where this recipe originates was “Too Hot to Cook”. I met the lovely Jessica of The Jey of Cooking while in Seattle this summer. She is an absolute sweetheart and the girl has great taste in food. 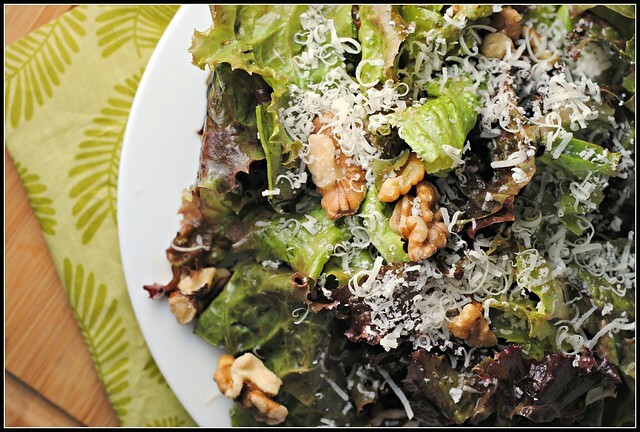 When I saw that this recipe came from her mother-in-law, I was so excited as one of my favorite salad recipes comes from one of my best friends. Therefore, I associate great salads with being passed on from one wise woman (or man) to the next. Right or wrong, I haven’t been proven wrong yet and I have Jessica to thank for turning me on to this keeper. Jessica said it best — while this salad is short on ingredients, it is not short on flavor. So, so good! Whisk together dressing ingredients and refrigerate until ready to use. 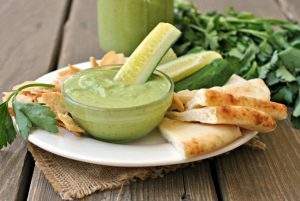 When ready to serve, toss the lettuce with the dressing to coat. 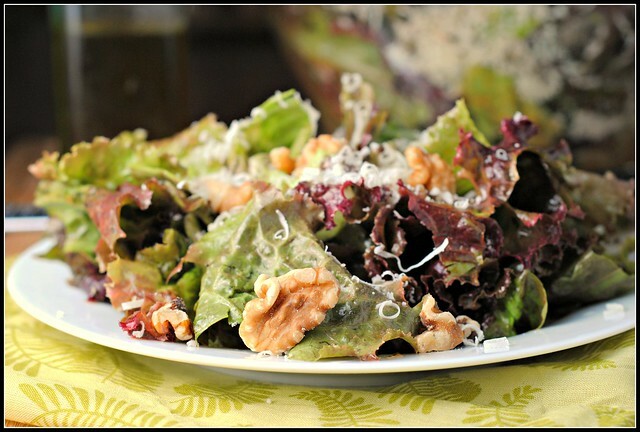 Toss in Parmesan and walnuts. Yield: 6 side salad servings. Result: Simple wholesome ingredients that combine for wonderful, crisp flavors. The tomato flavor was the twist in this and it added a great red hue and a sweet and tart addition. 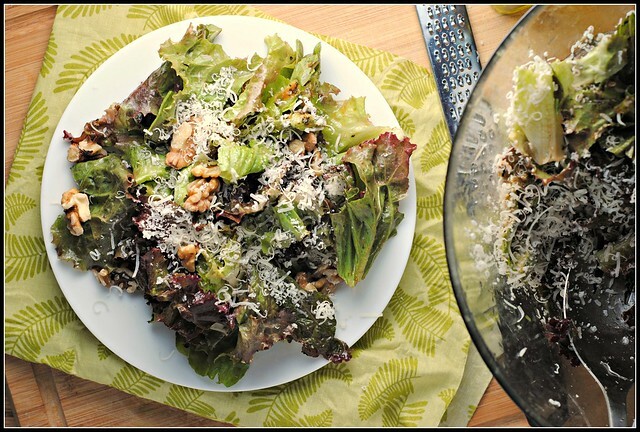 This quick salad dressing would be ideal for most any salad (or even pasta), but it worked beautifully with the simple additions of Parmesan and walnuts. 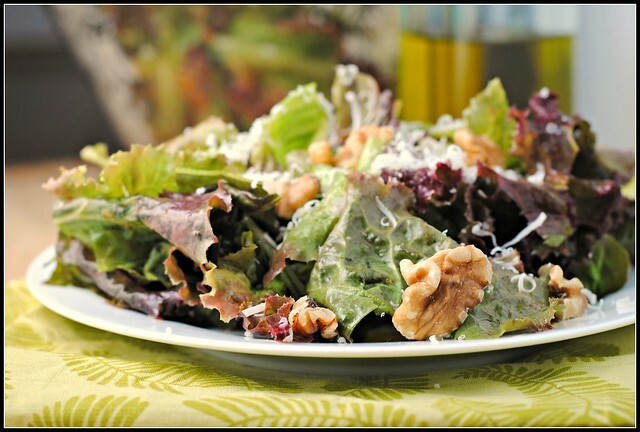 Plus, it’s healthy to boot — I love all the heart-healthy fats and omega 3’s in this dressing. A quick meal or side that won’t disappoint! Enjoy! Sometimes a good ol’ salad is the perfect meal! Sigh… walnuts are SO good. I just wish they weren’t so darn expensive all the time. I’d use them in almost everything! Your romaine is gorgeous – ours is always so pale looking. Lovely lovely lovely! And so simple, too! Yay, so glad you’re a fan! 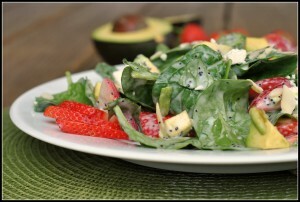 I love the simplicity of this salad, and your photo is GORGEOUS! I think after cashews, walnuts are my favorite nut and everyone in my family hates walnuts, wtf?! Woop on the first part of the cookbook getting submitted!! Today was NOT meatless Monday. We had cajun CHICKEN pasta! Love the comment Mr. P!!!! Great looking salad. I am not a huge walnut fan, but I think I am getting there. I keep on trying them so maybe one day I will have a change of heart. I want to like them, but my taste buds won’t let me! Glad you had a nice visit with your friend.